Research shows that loneliness and social isolation are harmful to our health: lacking social connections is a comparable risk factor for early death as smoking 15 cigarettes a day, and is worse for us than well-known risk factors such as obesity and physical inactivity. Loneliness increases the likelihood of mortality by 26%. Social isolation is a potential possibility for anyone in a state of grief. People can isolate themselves because they feel like no one understands what they've experienced or are going through. Janet Dean, from the Family Support team at Dove House, speaks of her experience ‘we support relatives after a bereavement and they often relayed their isolation. Some people keep on coming just for a chat and some social interaction. In our community, I have noticed older people who have been widowed might have no relative close by or friends.’ That’s when the idea of Friday Friends was born. Janet spoke to her colleague Tania, Community Engagement Officer at Dove House and together they organised a community group open to anyone who wanted to chat or make new friends. Sarah Cash, Director of Income Generation talks about the evolution of the hospice in the community. “Dove House has always been part of the community. It is funded by the community and provides for the needs of the community. These needs have changed and Dove House has adapted to them by diversifying its services. It is now a community hub with a cafe, a nursery and a day therapy unit which is open to anyone on a Friday afternoon. Friday Friends is a continuity of the services we offer.” Amy Johnson Unit couldn't be more different from what you would imagine a hospice to be. It is bright, airy, the walls covered with art and craft created by the day therapy patients. It also opens onto the large landscaped gardens with a pond full of large koi carps”. As I visit on a bright Friday afternoon, there are some old pictures and postcards scattered on the table. Everyone around the table is deep in conversation, sharing stories about their past, reminiscing on times long gone but not forgotten. A new comer to the group, Steven, 65 and retired from the army, tells me it reminds him of days spent with his mum looking at old pictures and listening to stories from her childhood. He explains “up to July last year I was a full time carer. I took early retirement and spent 10 years looking after my mum. She had leukaemia. She died 6 months ago and I could sometimes go a week without speaking to anybody. A lot of it was my own fault because I couldn't get out. I felt empty. I was brought up in Hull but lived in Berkshire before I moved up. I had such a horrendous Christmas. I thought I need to go out and see people. It was never lonely looking after my mum.” He came to the group after seeing a banner outside the hospice. With a big smile on his face he says: “It has been really nice just talking to people and getting out of the house. I will definitely be back”. Bereavement is a common story in the group, sitting next to me is John. “My wife died a year ago, we were married for 65 years. I go to Age UK on a Tuesday and go out with friends on a Sunday but when I leave them it is that awful feeling, emptiness. I have a son who comes morning and night and I appreciate that , but there is something missing all the time. I would love to meet somebody whether it is male or female where we could got out for a meal or go to the theatre or in Summer go out to the coast. Just someone to talk to. It is terrible”. He comes every Friday as part of his routine and enjoys the chats with the volunteers and other group members. Despite the sadness and the loneliness they feel at times, everyone around the table agrees that Friday Friends has been a wonderful addition to their lives and most come every week. What do they like best? Everyone talks about the cakes and of course a nice ‘cuppa’ but more than anything the company, someone to talk to, making new friends. Peter and Jack both 87 sit next to each other every week. 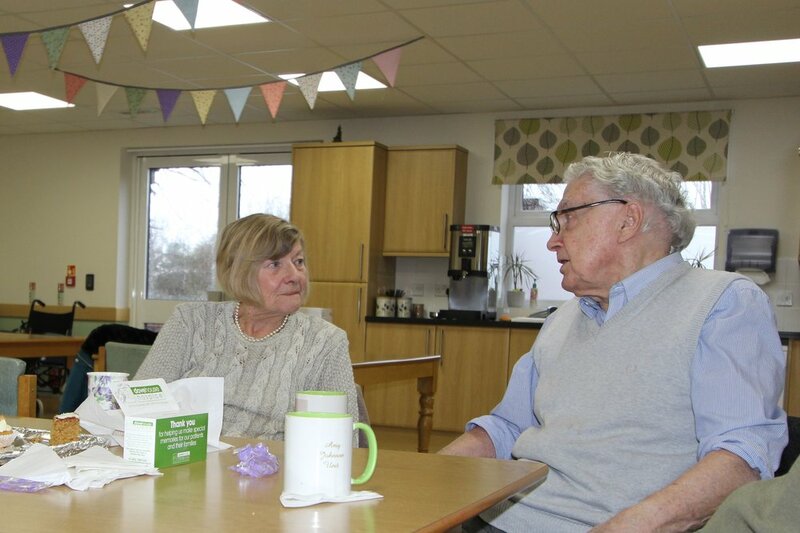 They met at Friday Friends and now meet for lunch every Friday at Dove House Community Cafe Dulcies before coming to the group. As well at a hot drink, cake and biscuits there are also games, art and craft, readings session, visits from local authors to name a few. Tania and Janet try to vary the activities every week but most of the people I met today come in for ‘a good natter around a cuppa’. It is only one of many services that Dove House offers free of charge to the community, although they are not free to provide. If you would like to support Dove House Hospice financially and ensure these services continue into the future why not join the lottery and help those in need in your neighbourhood. Find out more here.